Now Reading: Mughals knew best. Put your comb to the test! 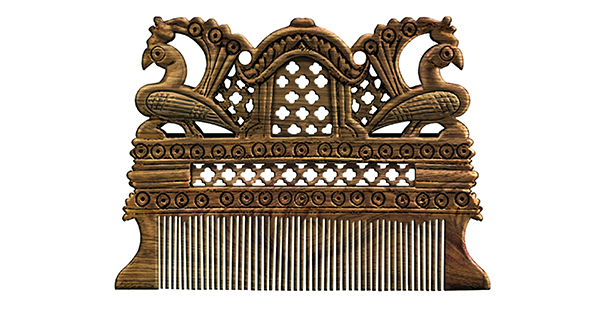 Ever been to a museum with Mughal artefacts and noticed the gold and silver jewel encrusted combs? Well, they had a more everyday version that was one of their best kept hair care secrets: The Wooden Comb. It’s a great alternative to the piece of plastic that you run through your hair every morning, which causes static charge, a big culprit for frizz. Plastic is quite harsh on your scalp and doesn’t do any favours to your hair follicles either. You don’t have to wait till the end of the week for that spa appointment. The bristles of a wooden comb have a massage-like effect on the scalp, which releases natural oils. This keeps the hair naturally conditioned along the shaft. What a relaxing way to start the day! Instead of complex headstands, there are other ways to get that blood pumping. Combing your scalp with a wooden comb activates the blood vessels at the back of your head, which supplies hair-loving nutrients to your locks. What happens after? Happy, effortless growth! As wood is a bad conductor of electricity, wooden brushes save your hair from any static-related damage and keeps the frizz under control. Bring on the rain! A wide-toothed wooden comb runs easily through your hair and detangles with ease, thus causing less damage and breakage. The natural oils released by a wooden comb open up pores, get rid of accumulated dirt, and works as a natural way to curb dandruff. The sleek, polished bristles of wooden combs glide through hair more easily. This means no scraping or bruises on your scalp while brushing your hair, which makes it perfect for people with a sensitive scalp. Get yourself a wooden comb and go soft, static-free and silky perfect.